This is a great post that honestly looks at some of the challenges. My wife and I lived in employee housing in Alaska for 14 years, some of it in a two-bedroom cabin, some of it in a very small room. There were times when getting away fro each other was a challenge! Being six wheels from homeless isn’t far off. If you had an accident for something you’d be homeless for sure! In my time working in Alaska, when we had to fire employees they also got kicked out of employee housing, and they usually left town that day. A person could wake up with a job and be homeless, unemployed and kicked out of town on the same day! I can see why you might get bored being a place for months at a time, but do you feel that you get a thorough exploration of the area by doing that? Add to the confines of a small living space, only one vehicle. It can definitely be a challenge! It truly depends on the area and the job. 4 1/2 months on the Kenia Peninsula was more than enough. 5 1/2 months in Lone Oak, Tx was TOO long. It all comes down to how far you can travel without your rig or are you willing to pack it all up for a “weekend” trip. We try to find jobs where there is plenty to see and do within a 150 mile radius. We also will only take jobs where we have the same days off. I think this summer might be a challenge. We are heading to Black River Falls, Wisconsin. Not sure there is enough to explore for 5 months. But, refer to truth #1, we aren’t on vacation. Great, honest post. You are amazing and best of all you guys are recording it all in photos and words. Thank you Martha. Sometimes a look within can really change your perspective. Another wonderful post with very honest lessons and outlook. The RV life is amazing, but it definitely comes with its challenges. It may not be the societal ‘norm’ of living, but it sure is full of unique and exciting experiences. I would not change this lifestyle for anything in the world! It has even expanded our social horizons–we’ve met more dear friends (such as you guys) and “neighbors” on the road than we ever did in our old sticks and bricks neighborhood. Thank you Dawn. I think the lifestyle is becoming more and more acceptable. Younger couples and even families are on the road now, as you know. Here’s to new friends and happy manatees! I really enjoyed reading this! While we aren’t full timers and we are retired, I can relate to a lot of it. Especially the small space thing. 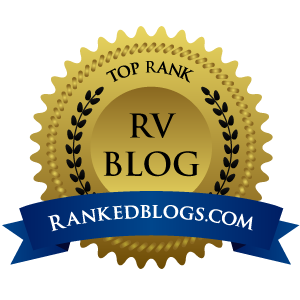 Wonderful writing that really speaks to us RVers. Thank you. Do you ever think about becoming a full-timer? I do think about it. Last year we spent 3 months on the road in the SW. Went home to the NW too soon. Cold! This year we are doing 6 months. Easing into it, lol. I’m not the driver and that gives me cause to hesitate. I like driving independence. I can understand the driving part. I can and sometimes do drive Waldo, but not very often. Especially in large towns and cities. Have fun this year! It’s nice to read honest posts about all this stuff. There are an awful lot of people marketing the lifestyle as some romanticized version of itself, and others who, unfortunately, think living the lifestyle entitles them to behave differently. That occurred to me when I read your comments about having made commitments and keeping them. I’ve seen a fair number of posts and Facebook comments about RVers bailing on jobs because they wanted to do something else. I’m not a huge fan of that and respect that you guys stick with your commitments, even when you get bored with the location. I also hear you on the space thing. Kevin and I get along great, but we are together 24/7 and yeah, sometimes having just a tiny bit of space is nice. Finally, I checked out your maps and they look great! It’s nice to see all of your travels in one spot…and confirm that no, no matter how long we do this, we’ll never see it all. On the other hand, we’ll see more in a couple years than most people will have the opportunity to see in their lifetimes. We’re all pretty fortunate for it. We hank you. There would have to be some dire circumstances for us to bail on a job. Boredom certainly isn’t one of them. I agree, we have already seen and done more than many and have lots of adventures yet to come. ~Happy Trails! I think your honesty about life on the road is refreshing and extremely helpful to those considering the lifestyle. Wishing you smooth roads ahead and the joy of being together. Thank you Sue. The lifestyle isn’t for everyone, but we really do love it.